The performing solution designed for integration with any type of device. Designed to offer high-end performance in complex environments while keeping power consumption low. • Powerful solution with 1.86 GHz Dual Core processor, to access any centralized infrastructure: integrates support towards Citrix XenDesktop, Microsoft RDS with RemoteFX and VMware View. 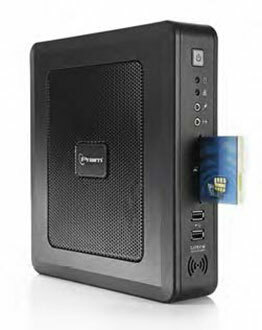 • 7 USB ports including two USB 3.0, four USB 2.0 and one internal USB 2.0. • High-end performance with low power consumption: 12W. • Simple, secure access to enterprise applications without the risk of Virus infection. • The integrated Smart Card Reader option offers a further layer of security on the endpoint. • Dual DVI video natively supports 2 monitors, expandable with PCI slot. • Standard 2 serial ports, COM1 and COM2 and 1 parallel port LPT1. • The WiFi support, with built-in antenna, offers an optional powerful wireless workstation. • Video resolution up to 1920 x 1440 with a ratio of 4:3 or 16:9 wide screen.